We offer A4 size and A3 size mini roll up standees without print and with print. Printing is on high quality laminated eco solvent vinyl for best color output. These mini table top stand are employed when you wish to meet your target audience across the table. With advancement in outdoor displays in last decade in India, there is out pour of products to catch audience attention. Sitting with prospective sales on a blank table is a thing of the past. In today's digital world every inch is a possible communication platform. We recently spoke to Senior Event Manager Mr. Kumar from Wizz Events regarding different display materials. To our surprise he spent well over 5 minutes explaining, detailing & some what arguing about optimism he share for this product. Earlier, it was acrylic all the way. Acrylic stands, name plates, placards were the one who used to rule the roost. Post year 2011, these counter table top stand have picked up in almost no time. Now as per Indian Events & Display magazine, they boast of around 5-10% market share which is a healthy growth. Acrylic displays: They also looks cool & appealing but tad below table tops. They are at par or little expensive than pop up table tops. 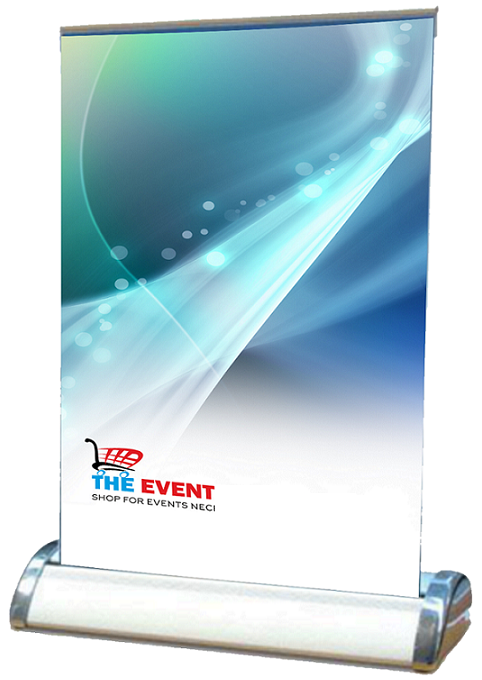 X Banner stands: These comes in same size and considered as cheaper options but they are far from appealing. 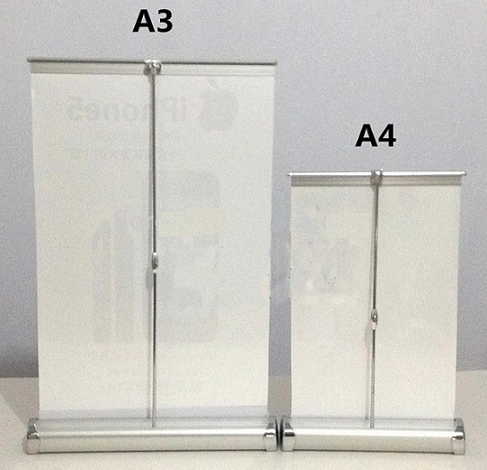 Sunboard stands: You also consider going with small size sun board cut outs with display stands at back. As sun boards are printed in bigger sheets there will always be Minimum order quantity associated with them. Big motivator in their favor is non restrictive size & custom cuts/shapes. Table top standee comes in 2 standard size which are A4 size & A3 size. A4 size is the size of the photocopy paper which is 8.27 inches i.e. 210 mm in width & 11.69 inches in height i.e. 297 mm in height. A3 size is exactly double of an A4 size, 2 A4 size paper placed beside each other make A3 size. A3 size is 16.54 inches i.e 420 mm in width & 11.69 inches i.e. 297 mm in height. As standard size of the display is A3 and A4 size. Therefore, design also needs to be in same size. You can get the banner design in any design software like corel draw, ai, photoshop, image format etc. Design resolution should be 300 DPI or more. Make sure your design is appealing & stands out. Don't overload the creative with too much of text. Keep a thumb rule of 20-30 seconds that much is the time a visitor will be at max looking at your creative. In majority of cases it is less than 3 seconds. We print table top stand banner on sturdy digital non tearable vinyl. NT banner has excellent photo quality printing and it doesn't pixelate like normal flex. Its average life is in excess of 3 years for outdoor & 5 years for indoor. Their is complimentary lamination film applied on to the banner. This keeps it scratch free & protect it from daily wear & tear, thus enhancing life span. You have option to go with either gloss which is shiny & reflective type or matt which is non reflective. We advise to go with matt if it is indoor & your stands are subject to sunlight or artificial direct light as it wont reflect. It is easy to replace your existing banner with new one. You can simply place order separately only for just replacement banners. You needn't have to pay amount for stand. Do you print table top in any other material apart from eco solvent vinyl? We print and recommend only high quality digital vinyl with gloss or matt lamination. You can also go with other cheaper alternative like flex/star flex without lamination. I wish to print more than 5 nos. but your website allow for maximum 5 nos.? If you are looking for printing more than 5 table top for your company then we can offer you great discounts, to know more, kindly feel free to contact us. If I place order for two designs 1 each then will I have to pay rates for 2 table top? If your both companies designs are different then you have to pay for 1 x 2 nos. A4 size is a standard paper size, paper used for photocopy and print. Size is 210x297 mm. These will be blank table top stand without any printed banner. Body color will be silver color. Printed on high quality eco solvent print with gloss/matt lamination.